The app will soon be available in the app stores. According to the World Health Organization (WHO), 7 out of 10 people die prematurely because of the global epidemic of noncommunicable chronic diseases (NCD). Unhealthy diet - and specifically the consumption of 'Ultraprocessed' Foods - is one of the major risk factors for a range of chronic diseases, including cardiovascular diseases, cancer, diabetes and other conditions linked to obesity. Noncommunicable diseases (NCDs) kill 41 million people each year, equivalent to 71% of all deaths globally. You are an individual person made of original cells. None of the generic diet recommendations will never fit perfectly into your actual present needs and health condition. Furthermore there's no advice when you need it the most - during the process of your grocery shopping. Foodgroot changes it from the scratch. Each food product is individually indexed and measured with up to 70 parameters. 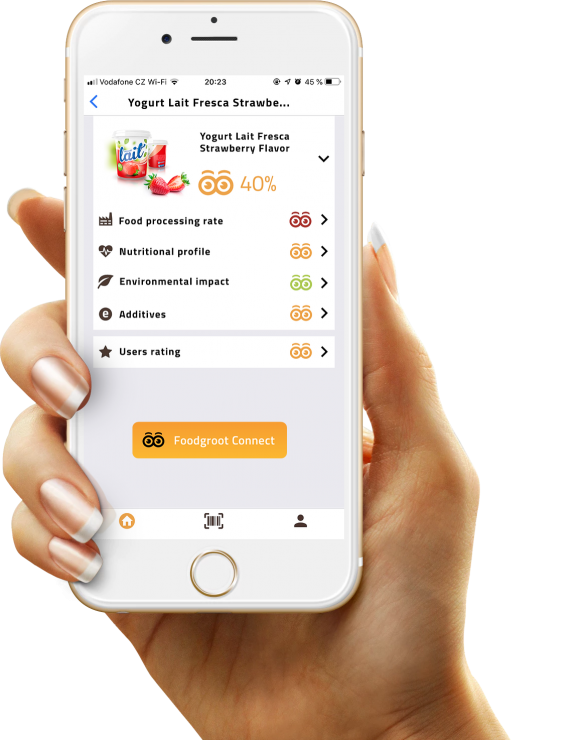 Its food rating score expresses a complex assesment of its origin and level of processing, health and nutrion value as well as sustainability impact. Based on provided personal data, the score gets gradually personalised. Food personalisation comes to you at no cost and fully integrated with your preferred online grocery store. All you do is click on the 'Foodgroot Connect' button and let the magic happen. By posting I agree with the processing of personal data for marketing purposes. Read the full wording of your consent to the processing of your personal information. Foodgroot.com s.r.o., Chudenická 1059/30, Hostivař, 102 00 Prague, ID No. 01930443, (hereinafter referred to as the "Administrator") hereby informs you in accordance with Article 12 of the GDPR about the processing of your personal data and your rights. Personal data is processed to the extent that the data subject has provided the data controller in connection with the conclusion of a contractual or other legal relationship with the trustee or which the controller has collected otherwise and processes them in accordance with the applicable legal regulations or to fulfill the statutory obligations of the trustee . In accordance with the deadlines specified in the relevant contracts, the administrator's record and retention order, or the relevant legislation, it is the time necessary to secure the rights and obligations arising from both the obligation relationship and the applicable legal regulations.